Sadie can hardly wait for Maggie to be old enough to ride horses with her. She finally seems to have accepted the fact that Maggie isn't quite big enough yet. For the first few weeks after Maggie arrived Sadie repeatedly brought both horses over and would put one of them next to Maggie and climb on the other. Here's a picture I snapped of Sadie this week. 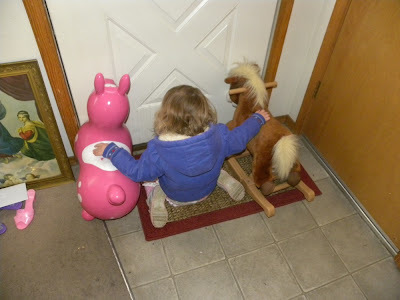 She brought her horses over to the door and sat there for quite some time waiting to go outside. We were still about fifteen minutes away from leaving, but when she gets an idea in her head it's hard to get her to be patient... the jacket is another example of that... it was in the eighties yesterday... yet she insisted on wearing her jacket everywhere. And when we went to the farmer's market she wore her pink snow boots and orange and green Wonder Pet gardening gloves.